Thanks to all who made 4th Annual West Seattle Bee Festival a success! 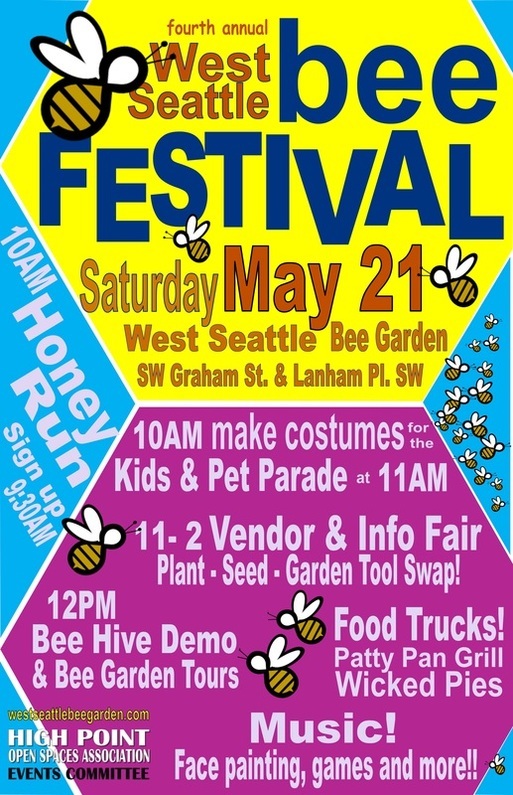 The 2016 festival took place on May 21st in High Point Commons Park - home to the West Seattle Bee Garden! Despite the rain at times, we enjoyed music, great food, kids activities, an incredible street fair, and opportunities to learn more about the West Seattle Bee Garden, other types of pollinators, sustainable gardening practices, and about big and small things we can do to help bees thrive! ​You can find coverage, as well as photos and video from the West Seattle Blog here. Our bee-themed Costume Parade for kids and pets - several face painters, a balloon twister, and artist Kimisha Turner with Nature Consortium, did an amazing job of decorating the participants! We had live bluegrass music by Ricky Gene Powell (who also led the parade), and his band. DJ Ron played world music throughout the day. Lauren and Krista gave a Hive Demo at the Bee Enclosure! Later, the Puget Sound Beekeepers gave tours of the Bee Garden and provided fresh honey throughout the afternoon! Sherry Lankston with Woodland Park Zoo brought their new "Up Close" pollinator program for kids of all ages! This included two very unusual, live "Ninja Pollinators," a Jungle Nymph named Julia and a Fat-tailed Gecko, Kibo. Our Vendor and Information Fair brought together businesses, community groups and organizations who have strong ties to our community or to bees; who promote health and environmental sustainability, who offer organic products and services that share this focus; or who provide resources and information to our community. We had our first-ever Plant - Seed - Tool Swap. It was a great opportunity to bring plants and take plants. The annual Honey Run, a free (1K - 2K - 3K, or more!) fun run took place. How fast and far could you go in one hour? The parade was on the runners' heels! Patty Pan Grill and Wicked Pies were there with amazing food! Do you have festival photos to share? Would you like to get involved or volunteer at the next festival? If so, we'd love to hear from you! Email us, or phone/text 206 240-5561. Thanks!